This triplet opal ring will add a little masculine pizzazz to any guy. 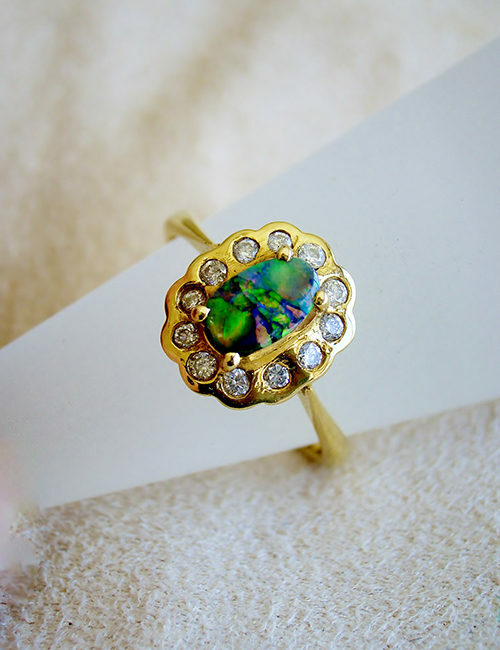 The opal glows with rich vibrant green and blue colours. The freeform shaped opal measures 13mm x 7mm with the silver band formed around the opal. The antis tarnish sterling silver band measures 8mm beside the opal and tapers down to 3mm wide on the underside for comfort. The ring is a size 10. Triplet opal consists of three layers…. A clear glass capping in the shape of a dome on the opal face which protects it. Triplet and Doublet opal resemble fine quality opal but are only a fraction of the value of solid black opal and shouldn’t be worn in water.